Together with the Flare S3 Power and the Flare XL, the Cherry Mobile Flare S3 Mini was also revealed on the CMF2015 brochure. The Flare S3 Mini utilizes a 4-inch capacitive touchscreen display of unknown resolution powered by 1.2GHz quad core CPU and Mali-400 GPU. The chipset is unknown and we usually bet MediaTek MT6582 SoC, but since the frequency is clocked at 100MHz lower, we are having doubts and we are putting into the equation that it can be from Spreadtrum. The RAM information is also not given, but at this price point we are guessing that it would have only 512MB, if it becomes 1GB, then that would be a lot better. Meanwhile, the internal storage is set to 4GB with a micro SD expansion slot up to 64GB. Camera wise, the one at the back has an 8MP resolution, while the one in the front has 2MP sensor. Other specs include dual SIM dual standby, WiFi 802.11 b/g/n, Bluetooth and runs on Android 4.4 KitKat. 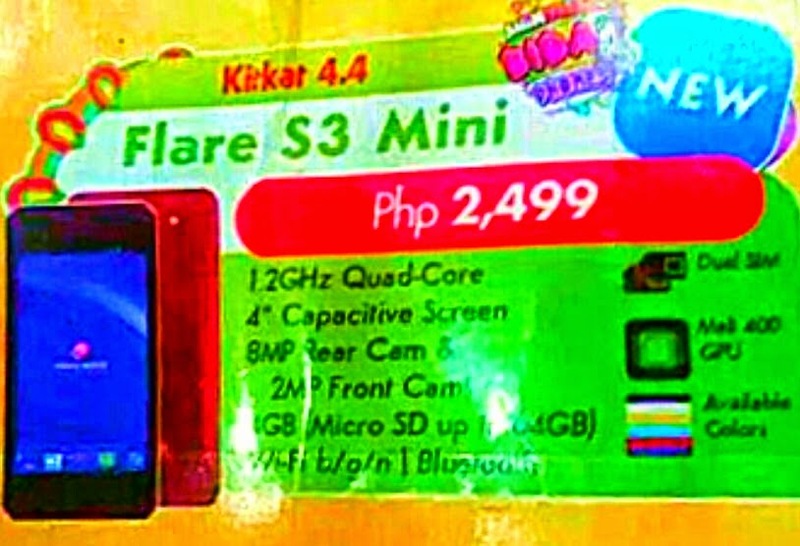 The Flare S3 Mini has a retail price tag of just Php2,499 and available in six different colors. Credits and thanks to the original owner of the photo.